Situated in the beautiful land of Peru and surrounded by the best sights of sand dunes lies the beautiful land of Huacachina which is a greatly fascinating land for all tourists coming here. Just around 5 km to the western side of Ica this is a tiny land that is a feast for the eyes. With the best sights of exotic flowers and palm trees and attractive buildings this is a way to prove that there was a glamour that existed here before. A very exotic locale in this part of Peru this is a visitors paradise and a perfect backpacking destination. Ica is the sister city of Huacachina and is a place where all buses stop. This is a city that is just around a four hour drive from Lima. In fact Huacachina is famous for being the only oasis in the South American continent and is the best place here in Peru where you get a lot of excitement and adventure. Dune buggy and sand boards are very popular here. Huacachina would have just around 200 people living here permanently so tourists love to roll on the sand and enjoy the fascination of tours here. There are many swimming pools here which add to the tourists’ travel kitty. The town is totally dependent on tourism and there are many reasons why the entire night here seems to come alive. This is a small isolated village and so things are a little on the expensive side here. Yet it is surely worth a try. Ica is known as the land of the sun as there are lot of asparagus, grapes and olives here. In fact Ica is the biggest Peruvian wine producer. So visits to Huacachina and Ica are filled with wine tours and many such experiences making travels here a great delight. Desert Nights is a popular International Hostel here in Huacachina. There is no dance club or swimming pool here yet the comfort and convenience is very good. Casa de Arena is another popular hostel here and is known also as a great night time party centre. If you want a quiet weekend this is not the place. But for all those who want active surroundings and vibrant ambience, this is the place and this where the tourists should visit. Thus come to this beautiful oasis here and enjoy the simple pleasures of the lagoons here and also the sandbanks, Huarango trees, and also palm tree groves. 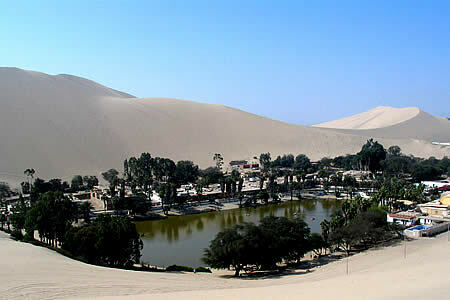 Huacachina was not inhabited at alle earlier till it was rediscovered by Angela Perotti who discovered the properties of the lagoons and water and sand here. It is a great experience to sand board here and it is one of the favourite pastimes for many who come to this part of the world. so all those who come to Peru love to come here and enjoy the pleasures of sand boarding and sand buggying here. Visits to Huacachina are thus filled with the best scenic delights, ideal sand boarding pleasures and memorable travel excitement. Coming here only fulfills the tourist’s need to do something enjoyable and cherishable. With the beauty of the surroundings and the pleasantness of the ambience tours here are only too interesting and effective. Visit Huacachina and enjoy the pleasures of a great land filled with the excitement and joy of a lovely travel destination .